Just a short one to let you all know that DC Retroactive: Justice League of America—the 90's is on sale right now. This is the final "Bwah-ha-ha" from the Giffen-DeMatteis-Maguire team (at least as far as the JL's concerned: we're already discussing new projects and one idea in particular has us seriously pumped) and, some unfortunate printing issues aside, the three of us are very happy with the way the book turned out. I've been playing in this sandbox with Keith and Kevin on and off for twenty-five years and it's been a fantastic run. Give the book a read if you're so inclined—and then check back here to share your thoughts. Thanks for nearly 25 years (on and off) of fun! It'll be remembered much longer than the horrible stuff that followed with Sue Dibney, Max Lord and Ted Kord. Looking forward to the next dose of insanity from you wild 'n' crazee guys! You're incredibly welcome, Jeff. I just spent a couple of days with Keith and Kevin at the Baltimore Comic Con and I was really amazed, and genuinely touched, by all the people who hold our work near and dear to their hearts. I hope there's a new Giffen-DeMatteis-Maguire project to hype in the very near future. It's just not fair the League is gone. It's like being taken from your friends for reasons you have no control over. And they they are brainwashed into disgusting bi-dimensional characters. You should all do some creator-owned stuff together, in the vein of Hero Squared or the brigade. I'd love to do an original project with Keith and Kevin, Ricardo, but Keith is exclusive to DC at the moment and there doesn't seem to be a lot of room at the Big Two for doing new, creator-owned characters. We have a project in mind that's probably a hard sell for the Powers That Be -- it's the last thing you'd imagine us doing -- but, if we can convince them, it'll be great. And if not... we'll find SOMETHING else. Are the Retroactive books reprints or original stories? I don't buy any DC books anymore, but I would buy JLI by you and the boys in a heartbeat. Here's hoping DC's 52 initiative is a raging success that opens up those kinds of opportunities not just for you and Keith but everyone in the industry. If it works, the day-and-date digital could bring in new audiences and create new needs. It's a brand-new story, Jay (as attested to by the four panels above us), bringing back the JLI's inept enemies the Injustice League and throwing in a little threat from Apokolips for good measure. There's also a reprint of the final Giffen-DeMatteis-Maguire story from our original run. I'll have to pick it up then! Am I looking for a one-shot issue or is it a mini-series? It's a one-shot, Jay: in, out and gone! It is sad to see it all end. The work you do with Keith (and Kevin whenever possible) is my favorite comic book work of all time - and Justice League being the first stories told by that team hold a really special spot with me. I am very much looking forward to anything else you may have planned with that team though. I just wanted to let you know that I absolutely loved this issue. I thought that, yet again, you were able to just nail what made that series so much fun. I loved all the nods to the series (The Dark Side, JLAntarctica, etc.) And Kevin's art? WOW. I would swear he is still just getting better with every comic he does all these years later. No one else does art like this in comics. A couple quick geeky questions on the issue - I was very surprised by the inclusion of the very emotionally driven JLA #60 over one of the goofier issues that may have been a more obvious choice. I did think it was a very fitting selection in many ways. I was curious as to if the issue included was chosen by you guys and what the thought was in choosing that particular issue. I'm also curious as to how specific you got when determining where this story would fall chronologically in the series. Did you just shoot for a general time period in your JLI run - or did it go as far as to know that this story takes place between issue X and issue Y? Thanks again for doing this issue and giving us one last fun story with all these old friends. Delighted that you enjoyed our JLI swan-song, Drew. And I wholeheartedly agree: Maguire just gets better and better. The guy's amazing. A genre unto himself. We didn't choose that issue. They asked us for some favorites and we gave them our choices, but then we were told it had to be a story from the 90's. (Which seems silly to me: So what if it's one from '88 or '89?) My sense is that they wanted it to be a story with Maguire art and, since Kevin didn't do many JLI stories after his initial run, and almost none during the 90's, they had no choice but to pick that one. I would have preferred "Moving Day" or "Aliens Night Out" or any number of other stories. C'est la vie! As for how specific we were being regarding where this story fit in continuity: we weren't. We aimed for a general time in the League's evolution and the rest is for other folks to figure out! Thanks for all your kind words. As noted above, it's adieu to the JLI, but not to Kevin and Keith. So here's to the future! Moving Day would have been a great choice. With the inclusion of the Injustice League I was somewhat expecting it to be JLI #23 (Maguire art - but 1989) or JLE #6 (the french class) - which is one of my favorites. Thanks again for one last trip down memory lane. Looking forward to the next adventure you guys have in store. Don't get too much of a headache trying to figure out where the story fits, Drew! "The French Lesson" and "Justice League Antarctica" are two stories that both Keith and I consider among our very best. Of course the first is JLE -- no Kevin, either -- and the second is way too long for a back of the book reprint. Of all the Retro JLA books, I thought this one was by far the most successful at (re)capturing the flavor of the era it was replicating. Thanks so much, Rob. The response to the JLI RETRO has been great and that makes me very happy. I think one of the reasons the book worked is that, for us, it really wasn't an exercise in nostalgia: We've all continued working together, on a variety of projects, for years. We didn't have to recapture anything, we just had to keep doing what we've been doing all along. And I hope we get a chance to keep doing it, with new characters, sometime soon. In some parallel universe, where DC still has the rights to Jerry Lewis and Bob Hope comics, you guys would be perfect for those books! I want to do the Dean Martin-Jerry Lewis book, Rob. (It didn't become a Jerry solo book till the team split up.) It'd be better than Beetle and Booster! I actually loved those comics as a kid. It'd be fun to spend a Sunday afternoon reading through a stack of them. Might be fun to see GHOSTBUSTERS get the DeMatteis/Giffen/Maguire treatment...but I guess that's IDW right now. Thought of this with recent news that GB3 is reportedly a go with or without Murray. Actually, GHOSTBUSTERS would be a great fit for our idiotic sensibilities. But, as you noted, that's IDW: Keith G is DC exclusive. Finally got to read the Retro: JLA issue. It was a blast. A great send off for you guys. There was some serious laugh out loud moments, great artwork, and just snappy dialogue. Really, it was a lot of fun to read. Thanks, JM. I can't wait to see what you 3 are going to get into down the road--sooner rather than later, please! : ) A question: have you 3 considered doing a self-published book? Or with Keith DC exclusive prevent him from doing that, too? I am sorry to hear this will be the last of your guys work together on JL, but I cannot wait to get it. I never fell in love with comics until I stumbled into JLI books at my local comic shop, and while its sad to see it ending, I cannot wait to see what you guys do next-you always create such fun, touching, and beautifully drawn and well-written work. Keith's exclusivity pretty much locks him up with DC for now, A. Jaye. That said, I'd love to do an original with those guys. Keith and I, of course, did just that with HERO SQUARED. So glad you enjoyed the RETRO book. Response has been so positive and I'm very grateful. That really was fun, wasn't it, Meg? Can't believe it was the first time in all these years the three of us were together for a panel. The Baltimore Con is really something special. As someone who spends a good part of his time alone in his room playing with his imaginary friends. it's a genuine pleasure to get out and meet the people who read, and appreciate, my work. Don't know yet what's next for the Giffen-DeMatteis-Maguire team, but whenever those two guys are ready to go, I'll be right there with them. When you read JLI RETRO, please check back here and let me know what you thought. "GHOSTBUSTERS by Alan Smithee, J.M. DeMatteis & Kevin Maguire. DC will never know! :) "
Surely Ian Montgomery, rather than Alan Smithee? I truly enjoyed this issue. I love the JLi, so much I don't own a good number of the issues. Confused? allow me to clarify, this way when I'm having a bad day, or week, or month, or in my case usually lifetime, I can always go and pick a new one up. That being said, I thought there where two things missing from this ending of a legendary run, the first being the lendary phrase "One punch" worked in somewhere. 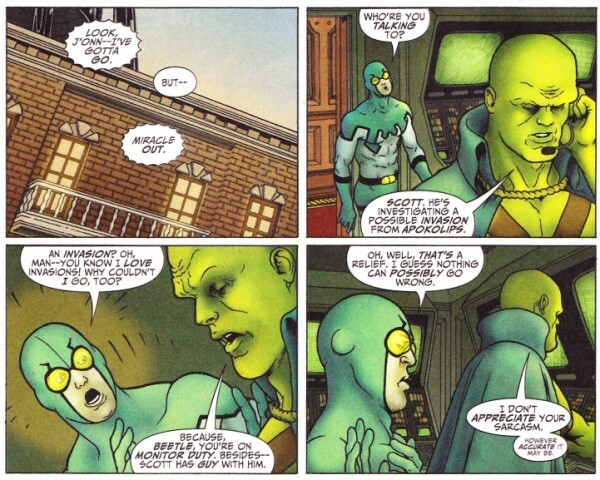 And second, a closing scene with Booster and blue beetle sitting on a balcony sipping scotch and smoking cigars, as booster sits with his in his ear. The impact that book had on comics is amazing, and can be shown through two characters, and how I view them. First is Guy, I hate Mr. Gardner, but I love to hate him... it's fun to groan with annoyance as arrogantly spreads his over sized ego all over any unsuspecting character that stands in his line of atom bomb sized fire, and like wise it is indescribable to explain how great it is when he receives his competence from someone. Second, is Booster... I hate him, not love to hate him, just hate him. He annoys me to no ends, but to have that strong of a feeling for a fictional character takes quite some skill on all parts. Sure there are characters like Blue (Ted) Beetle I love because of that run, and long loved characters like Batman who you found a new, original, and highly interesting, as well as enjoyable way to deal with, and I could go on for hours about them, but in the end isn't tjhe ability to truly hate a character a greater sign of talent. And finally, I'll have to apologize for my skepticism, but I don't think we've seen the end of the JLI, or the classic triunes dealings with them. Sure, I believe you think your done, but in a medium boasting "Legends of the Dark Knight," "Untold tales of spider-man," and "Captain America: Sentinel of Liberty" can you really say that a few years down the line you won't see some way-more-than-it-needs-to-be Dark grim comic in a fan's hand, or at the newsstand and suddenly think, "Good God, I've gotta get the band back together?" Maybe you can resist, may be you can learn to live with other characters enjoying the bwa-ha-ha style, and maybe not, but people are odd little things that often slink back into the familiar, but also explode forward to the new, and every tick of the clock can seem an eternity, so in the end perhaps only time can tell. So what you're saying Jack is "never say never," which, really, is wise advice. Beetle and Booster on the balcony? Perfection, Jack, perfection! What's funny is that last night, for the first time in quite a while, my wife and I popped in a Boston Legal DVD and watched a few episodes -- and one of them was a "Denny with cigar-in-ear" episode! Thanks, as always, for your insights, Jack. Goodwill and hipness right back at you. I heard about that, A. Jaye. A nice tribute. Will G'Nort be in the DCNu? Whatever is, was, and whatever was, will always be. So, yeah, he'll be back, because he was never really gone. Not even before he was here! I think DC needs some time to nail down its new continuity, but after that happens, I hope we'll see a return to parallel universes. It'd be cool to see the DCNu characters revisit the "old" world. On some level, I blame Marvel's success for the way DC shies away from the multiverse. There's advantages to tighter continuity, but once you're blessed and cursed with over seventy years of continuity, I say embrace it all! Go for broke. Because one universe just isn't enough for my tastes. Or, as Walt Whitman says, "If I contradict myself, I contradict myself. I contain multitudes." A universe without G'nort would be a sad universe indeed. I honestly have no clue how the new DCU will play out -- I'm not involved at all. TIme will tell. But I suppose I'd rather the MU go on without either than have them pass through the hands of writers who don't "get" them. No concept can be all things to all people, so better left untouched than marred. I've heard fans mention the possibility of Ben Reilly returning as a villain, for instance, which would go over about as well as G'Nort the machete-wielding antihero. And whatever becomes of the characters I love so much in their universe proper, they're always there for me when I need them. That last sentiment is right on the money, David. I couldn't agree more. Sorry, David: your 8/25 comment about the rebooted DCU was stuck in a folder and I didn't find it till today! That said, I agree: here's hoping it's a big success, for them and the entire industry. Boa noite sr JM DeMatteis, lembroqua quando estava saindo da infancia, por um acaso li uma revista da sua liga, aquilo me facinou, ri muito, aqui no Brasil é unanimidade que a JLI foi a melhor liga de todos os tempos. Well, THIS is a first: a comment I don't understand (well, aside from the words "JLI" and "Brasil"). I'm going to assume it's all very nice and say "Thank you." And, if it's not...I'll never know! Via Google Translate: Good evening Mr. JM DeMatteis, lembroqua when he was out of childhood, by chance I read a magazine in the league, what facin me, laughed a lot, here in Brazil is unanimity that the JLI was the best league of all time. Thanks for the translation, Jeff -- and very much looking forward to seeing you in November for the IMAGINATION 101 workshop! I hear Lucas Hart is gonna be a guest speaker (re-reading Seekers this week)! Into the Mystery we'll go, Jeff! I don't want any part of a DC Universe without G'Nort! I just picked up my copy of this book yesterday, and it was the first one I read when I got home. This book served as a great reminder that comic books can still be fun! Sometimes I find comics get too bogged down in being the darkest, the grittiest, going for the most shock value, and we forget that we're also allowed to just have a good time. It's like coming home to see these characters together for a send-off before DC's continuity resets, great job to all involved! Thanks, Jay. We had a great time working on the story and I'm hoping that there's a new Giffen-DeMatteis-Maguire project waiting in the wings. The ball's in DC's court right now.